So the holiday is already feeling like a distant memory but before it disappears completely I thought I'd do a round up of what I took with me & my thoughts & rules on packing a capsule wardrobe for your hols. I've previously written a couple of posts on this subject here & here & if you're anything like me you'll hate packing with a vengeance. Trying to decide what to take used to take me ages with trying to work out how I could take all my favourite pieces, which tops would go with which bottoms, what shoes, bags & accessories would go with which outfit until I'd not only totally confused myself but worn myself out in the process. 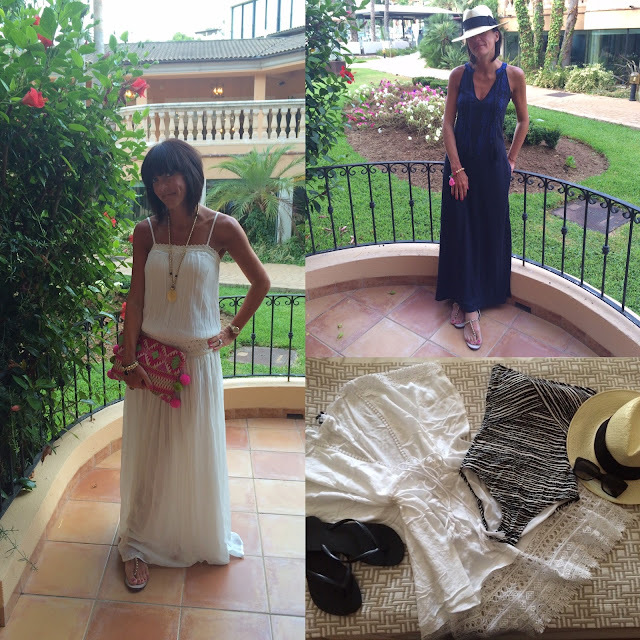 Then last year I had a bit of a lightbulb moment & decided to take just one pieces - dresses & jumpsuits in mainly neutral colours with a selection of brightly coloured jewellery & bags to help accessorise the outfits to create different looks. So with these rules in mind when packing this year I managed to get myself done & dusted in less than 30 minutes, which has to be a world record for me! 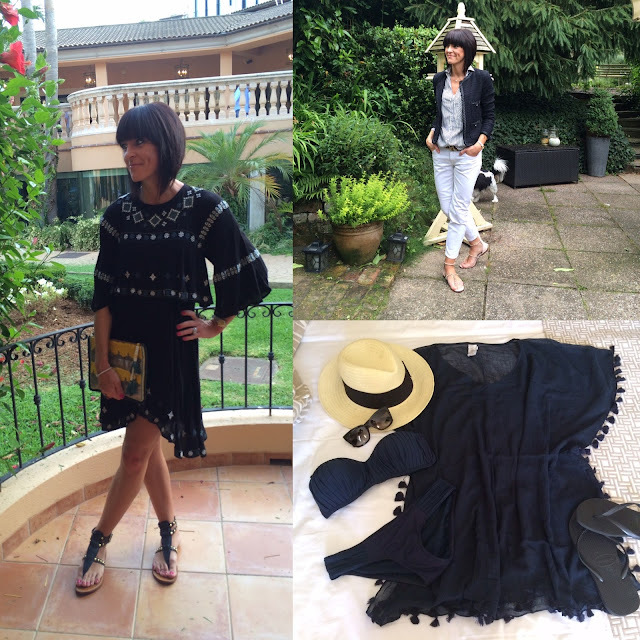 This year I not only kept to one pieces I've also stuck to a colour palette of creams & blacks, the only exception being my denim shorts & striped top & navy maxi which I just couldn't resist packing. 1 maxi dress, similar here. 1 pair of shorts, similar here. 1 off the shoulder top, similar here. 4 dresses, similar here, here, here & here. 6 kaftans (which I'll admit I could easily have lost one or two but hey they don't take up that much room do they ;-) ). See here, here & here & similar here, here & here. 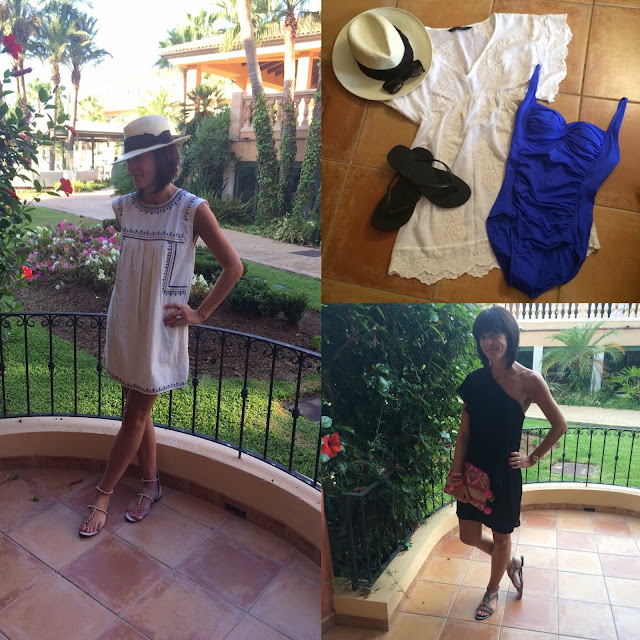 3 Swimsuits, see here, here & here. 2 Biknis, see here, here, here & here. 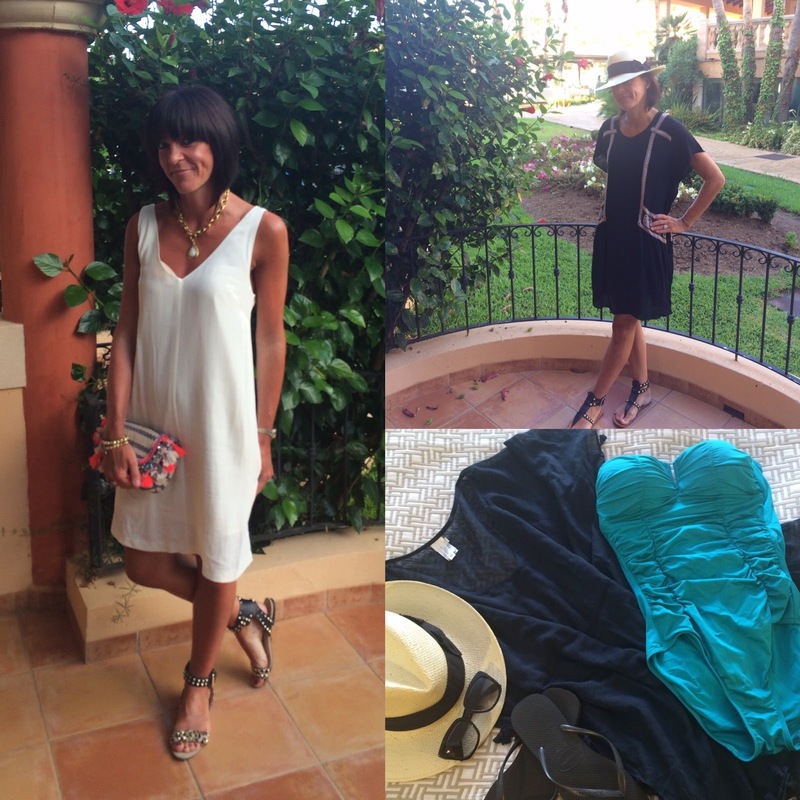 2 cream knee length dresses, similar here & here. 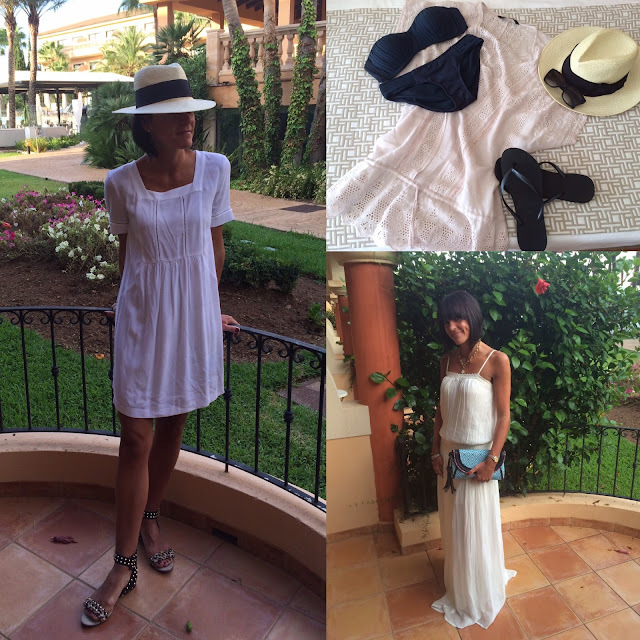 1 cream maxi dress, similar here. 2 black knee length dresses, similar here & here. 1 black maxi dress, similar here. 5 statement clutches (again this could have been reduced), see here & similar here, here, here & here. A selection of jewellery, this necklace would be perfect for being a great multi tasker. 2 pairs of flip flops, see here & here (again I could easily reduce this to 1 pair). 4 pairs of sandals, see here & similar here, here & here (whcih could also be reduced probably just to 2 pairs if I was being strict!). 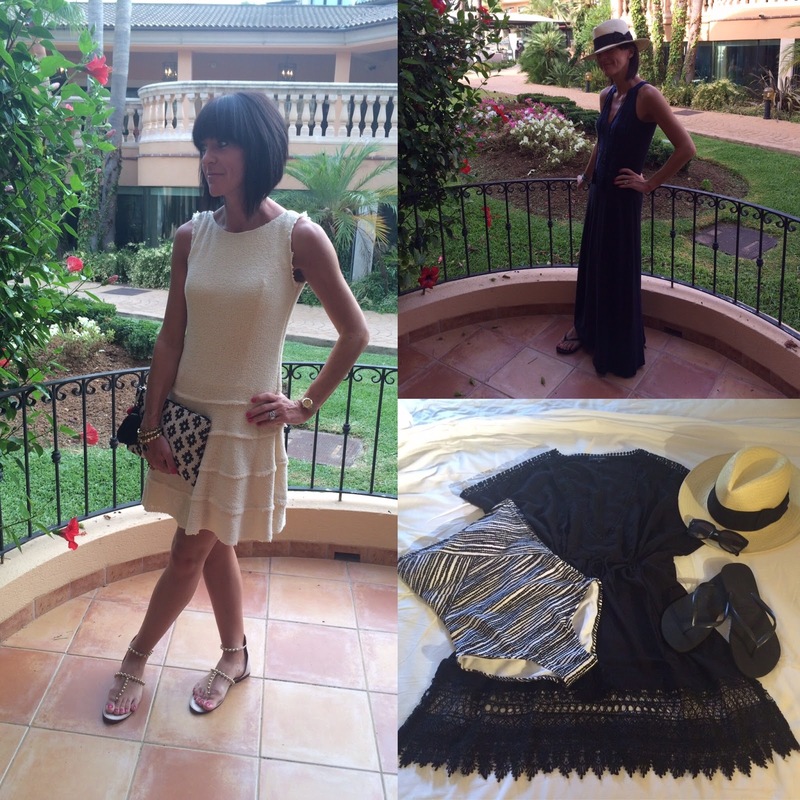 And here's a round up of my outfits from the holiday. For those of you who have asked how I've found the Charlotte Tilbury Beach Sticks (see my post here) I absolutely loved them & would highly recommend. I wore them as I'd planned in my post & found them to be really easy to blend. They go on really smoothly & you just build colour to suit, the only negative I can think of is they're addictive so you have been warned!! Back to today & here's what I'm wearing. So what had planned to be a very quiet day in loading up on carbs ready for a night on the town with some friends has now turned into a mad dash trying to finish off the painting we started yesterday & tidy the house. As usual my time management leaves a lot to be desired & I have SERIOUSLY underestimated the time it would all take but hey ho we've got bubble o'clock to look forward to :-) To say I'm a teeny weeny little bit excited is an understatement, although we're supposed to be up bright & early tomorrow morning to hit an antique fair which could be interesting!! So what do you think, do you think I managed to travel light for our hols or did I over pack? I always like to dangle the carrot of potential holiday purchases when packing, let alone the thought of having to unpack it all & wash & iron it when I get home so I always try to keep room in the suitcase. How about you how do you go about packing for your holidays? Any tips you'd like to share? I'd love to hear your thoughts. See you tomorrow & if you want to see what I'm wearing tonight I'll be posting a picture on Instagram later (follow me here) there may even be a sneaky holiday purchase or two coming out to play. 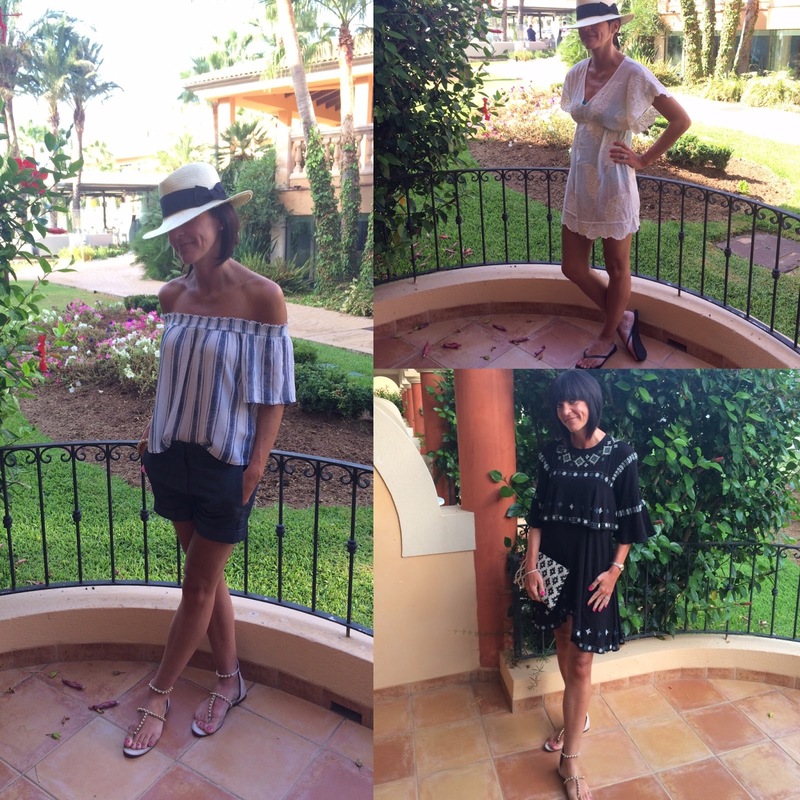 Hope everyone has a fab Sunday & don't forget you've got until tomorrow to get 20% off all purchases with Coco Bay use code MIDLIFE20 at checkout. I seriously can't rate their swimwear & accessories highly enough, it's amazing quality & seriously didn't budge an inch, even with out the straps! 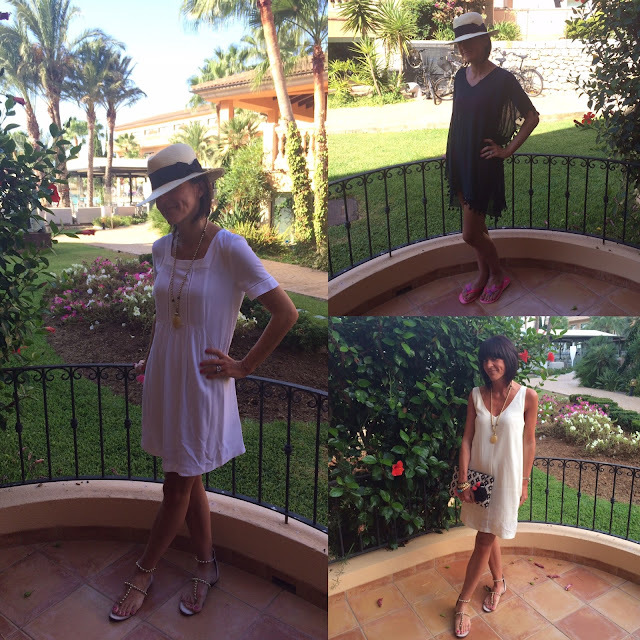 Thanks Lynne, one pieces are definitely the way to go & I could easily loose a day & evening dress....the trouble is when we don't get the weather here to enjoy wearing our summer clothes you just want to take it all away with you don't you?!! Looks like you got it spot on Jane....Love how you have broken it all down for us! Even though I think I have got my packing pretty near perfect, I always end up with a couple of items that I don't wear. I think until you get to your chosen destination you never know what the dress vibe there is going to be?! That's where we're quite lucky for summer holidays Helen as because we return to the same place I know what clothes I'll be needing which makes it so much easier & of course knowing it's going to be good weather helps too otherwise that would be a whole different minefield!! Yes we were Rhona, we absolutely love it there - well spotted! Thanks Becky one pieces are definitely the way to go so much easier & less space.